Kanara is the Coastal region of Karnataka retrieved by Parashurama from the sea by throwing his axe, Hence the region is called as God’s Own Land. Karavali and Coastal Karnataka district are famous for palms trees, exotic beaches, classical dance and buffalo racing sport. Here is the list of tourist attractions and tourism in Coastal Karnataka. Dharmasthala Temple in Dakshina Kannada is one of the most famous Shiva temple in Karnataka, on the banks of the Nethravathi river. 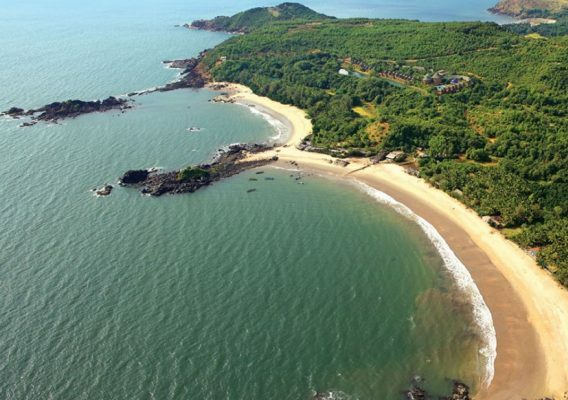 Gokarna is famous for its beaches, Mahabaleshwar temple of Lord Shiva and a must visit holiday destination in India. 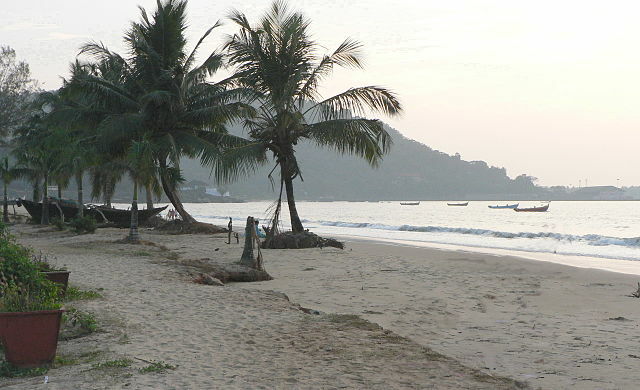 Om beach is the most famous in Gokarna along with Paradise Beach and Half moon beach, known for surfing. Karwar is one of the lesser known green city of India and eco tourism destination in Karnataka. The seaside city situated on the banks of the Kali river and home to small mangrove covered islands, Kali river estuary and Anjediva Island. Udupi is a Tulu city, notable for the Krishna Temple,Kanakana Kindi and popular Udupi cuisine. This temple city is known for list of temple festival, Chariot Festival and Aati kalenja traditional folk art by Tulu people. Udupi Sri Krishna Matha is dedicated to god Krishna and one of the most famous temple of Lord Krishna in South India. The Krishna temple is known for its customs, traditions and festival. Udupi dishes made from grains,vegetables and served on a plantain leaf, Popular dishes of Udupi cuisines are different types of spicy rices, Neer Dosa,Mangalore bajji, Patrode and Kotte kadubu. Coconut and curry leaves are the two most common ingredients for fish and chicken dishes of Mangalorean Cuisine, Mangalorean fish curry is the most popular dish in Coastal Karnataka. Mangalore port city of the Dakshina Kannada district is known as the Gateway of Karnataka. The city is one of the most multicultural non metro cities of India. Tourist attractions in Mangalore inlcude Kadri Manjunatha temple,Mangaladevi Temple, Milagres Church, Saavira Kambada Basadi, annirbhavi Beach, Sultan Battery and Gokarnanatheshwara Temple. 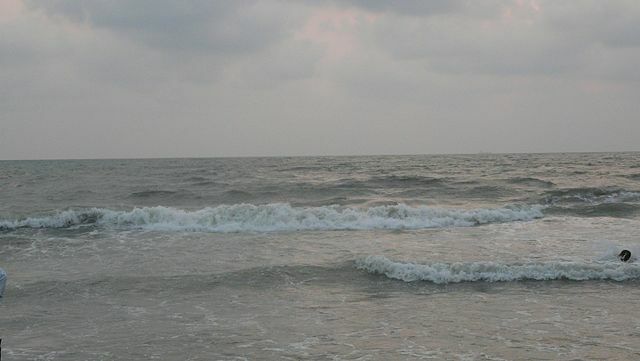 Panambur Beach of Mangalore is the best maintained beaches of India and popular for its picturesque sunsets. The beach has water sports activities like chariot rides, boating, Jet Skiing and dolphin viewing. Mangalore city is also known for other famous sea beaches such as Tannirbavi beach, Ullal beach, NITK beach and Someshwara beach. These beaches attract tourist for dolphin viewing, jet ski rides and Open of Surfing. 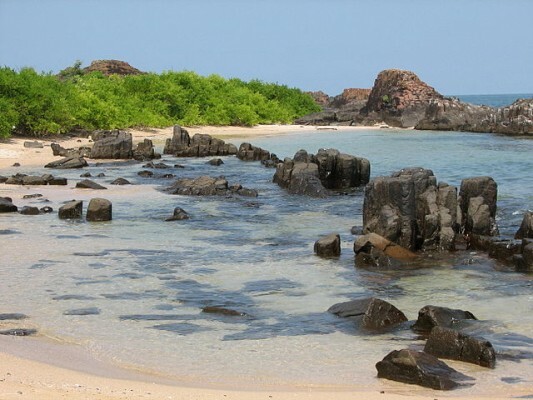 St. Mary’s Islands or Coconut Island at the coast of Malpe in Udupi is known for distinctive geological formation of basaltic lava. The islands listed as one of the four geological monuments in Karnataka state. 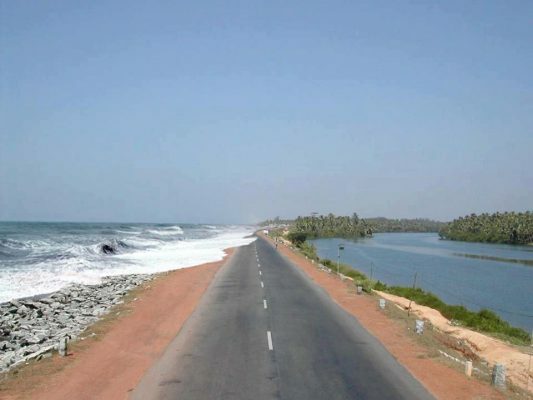 Maravanthe is known as God’s Own Land, known for spectacular scenery where Suparnika river almost touches Arabian sea. The most beautiful beach of Karnataka is considered the only one of its kind in India. Yakshagana traditional art form is a theatre style unique art form, mainly found in Tulunadu. 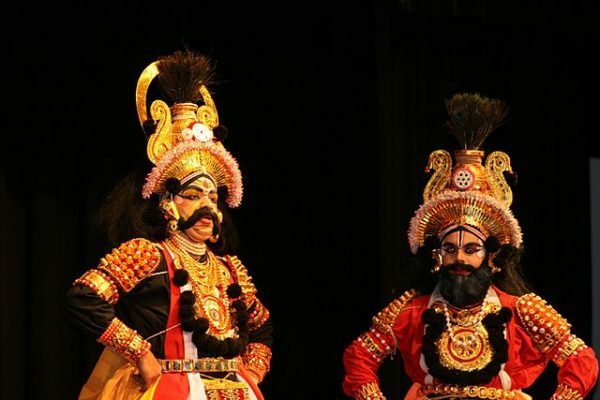 Yakshagana performance is very popular in Udupi and Uttara Kannada. Buta Kola, Nagaradhane and Aati Kalenja are other unique rituals and traditional art form of coastal Karnataka states and on the edge of extinction. Kambala is an annual Buffalo race, held in the coastal district’s of Udupi and Dakshina Kannada, region known as Tulu Nadu. Kambala and jallikattu are two different animal sport, criticised by animal lovers. Kali River of Karnataka is the lifeline of Uttara Kannada district people and fishermen on the coast of Karwar. The Kali River flows west and join Arabian Sea near the pictureseque Sadashivgad fort. 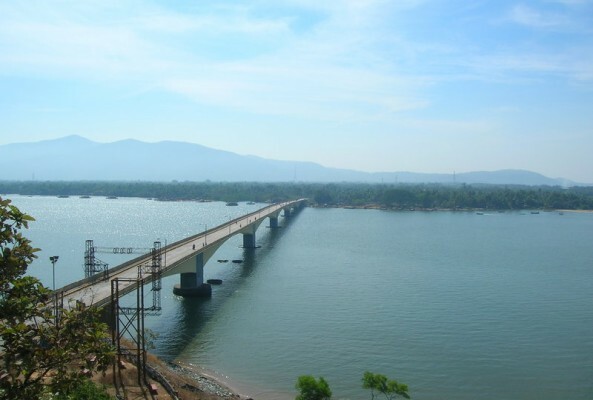 Sadashivgad Fort is a popular tourist destination in Karwar, located by the Kali river bridge on National Highway NH-17. 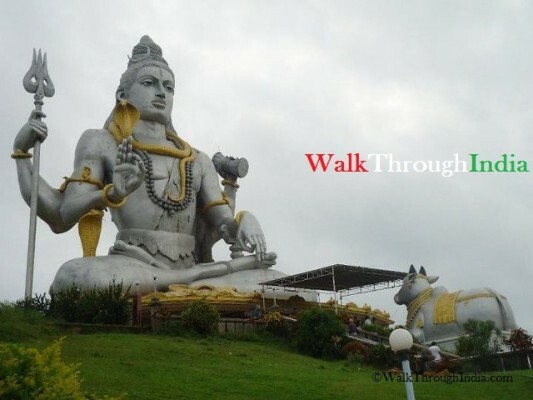 Murdeshwar coastal town is famous for the Murdeshwar Temple and tallest statue of Lord Shiva in sitting posture. The temple is built on Kanduka Hill and surrounded by waters of the Arabian Sea in Uttara Kannada district. 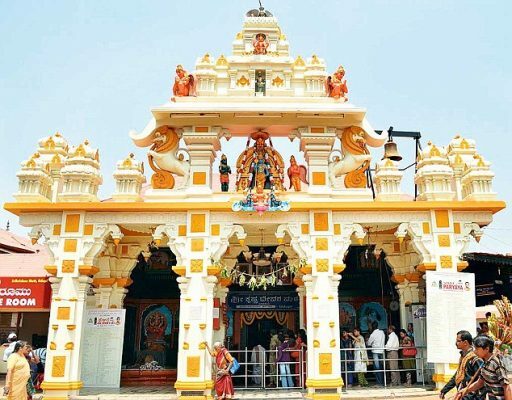 Karkala in the Udupi district has a number of natural and historical landmarks, such as Padutirupathi temple, Chaturmukha Basadi, statue Gommateshwara Bahubali and St. Lawrence Shrine. Kollur temple town is famous for the Mookambika temple, dedicated to supreme goddess Mookambika or Durga devi. Tourist places around Kollur include Kashi Theertha, Arishna Gundi Waterfalls and Kodachadri mountain peak.